SOPO Editor’s Note: This debate originated over a year ago, when Jim Epperson (biography at http://www.civilwarcauses.org/bio.htm) and Brett Schulte (http://www.beyondthecrater.com) realized on a TOCWOC Blog post on an entirely different topic that they differed with regards to the Sheridan-Warren controversy at the April 1, 1865 Battle of Five Forks. Jim suggested a classic debate format to iron out our differences, and the rest is history, pun absolutely intended. 🙂 The post below, as well as one which appeared earlier today contain this debate. In part 1 of this debate, Jim Epperson led off with his opening arguments, attempting to prove that Phil Sheridan was justified in relieving Gouverneur Warren from command of the Fifth Corps as the Battle of Five Forks wound down. In part 2, Brett will attempt the opposite, and Jim will close the debate with his final remarks. Fifth Corps commander Gouverneur K. Warren: Was this deliberate and arrogant general his own worst enemy? Was Phil Sheridan justified in relieving Gouverneur Warren before or during the Battle of Five Forks? I don’t believe he was. Warren’s only real error was to have a different leadership style than Sheridan, a man who liked his generals to lead from the front.1 The reserved engineer Warren did good work at Five Forks, ultimately contributing to the magnitude of the victory by blocking a key Confederate retreat route. When Fifth Corps arrived at Dinwiddie Courthouse, Warren was not at the head of the column. This is a true statement, but in itself does not excuse Sheridan from relieving Warren. Besides, the fourth point below indicates “the particular errors which prompted Sheridan to relieve Warren came during the battle,” so this point would appear to be irrelevant. In any case, a Corps commander should be where they feel they will make the most difference, and Warren appears to have believed his place on the night of March 31 should be where his rear actively faced the enemy along White Oak Road. Given the history between these two soldiers, however, this perceived slight didn’t help Warren in what was about to unfold. Warren had a bad habit, throughout his tenure as a corps commander, of substituting his own judgment for that of his superiors. What’s more likely: Sheridan telling the whole truth or Sheridan wanting to make himself look justified in sacking Warren even after a victory to which Warren contributed? 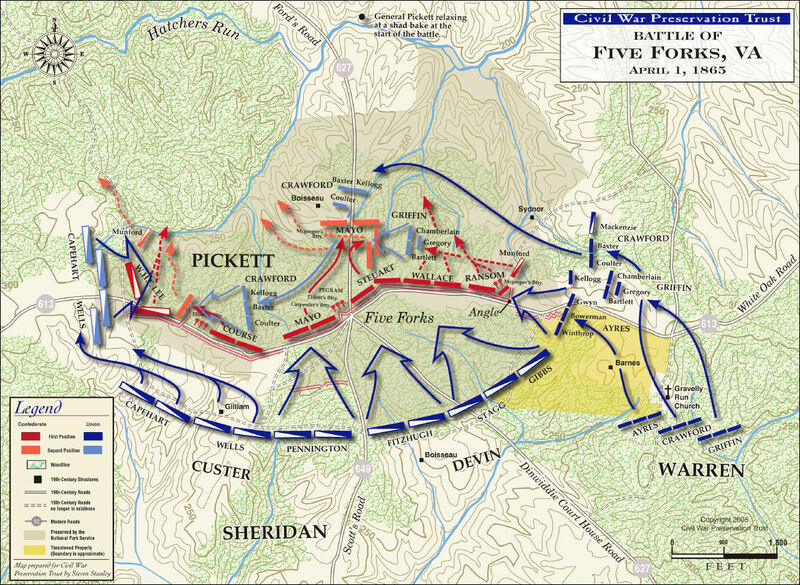 The particular errors which prompted Sheridan to relieve Warren came during the battle. Sheridan was too hasty in relieving Warren before finding out any facts. He admitted during the Court of Inquiry to not knowing and not caring what Warren did during the Battle of Five Forks.12 How could Sheridan justify relieving Warren if he had no idea what he was even doing? My only direct response to Brett’s nice set of points is that a corps commander should always know what is in his front. So, while the mis-placement of the “knuckle” is indeed Sheridan’s fault (initially), Warren should have had a skirmish line out front which should have known enough to report back that the knuckle wasn’t where it was thought to be. I totally agree that my several numbered points were by themselves not “fireable offenses.” My point was that Sheridan was operating under the directive that “if, in his judgment, the Fifth Corps would do better under one of the division commanders, he is authorized to relieve General Warren …” The several items that I listed apparently gave Sheridan the impression that “the Fifth Corps would do better under one of the division commanders,” therefore he relieved General Warren. In a very real sense, that should be the end of the discussion. Military organizations are loathe to second-guess commanders in the field, and Sheridan was exercising discretion granted to him by the commanding general. Was it mean, perhaps even cruel? Quite probably—I won’t argue that, it isn’t really relevant. The point is that Sheridan had cause to believe that “Fifth Corps would do better under one of the division commanders.” Therefore his relief of Warren was justified. That’s really the end of the story. If you missed it earlier, check out Part 1, and make sure to leave your comments below. What do you think? We’d love to have more people join in this discussion. I’m with Jim on this debate. I dont like what Sheridan did, but it seems justified to me. In the order that Sheridan received from Grant, the criteria was not ‘if Warren screws up’ or ‘if Warren is slow’, but simply if Sheridan felt the Corps would do better under someone else. Screwing up or being late can be analyzed objectively, as Brett and the Court has valiantly done. But Sheridan judging that someone else could do better is an entirely subjective matter. So while the court might have found that there had been “no unnecessary delay” in Warren’s movement, it never found that Sheridan did not think Warren took too long. Brett writes that “Warren’s only real error was to have a different leadership style than Sheridan”. Seems like thats all the justification Sheridan needs. I don’t see how it can be justified given that Sheridan relieved Warren without ever bothering to figure out where he was that day. Had he done so, he would have realized Warren contributed to the victory as much or more than he did. Like I said in the comments which led to this debate, I wouldn’t have had a problem with Grant relieving Warren for Spotsylvania CH, for June 18, for the Crater, and for other things, but he should have relieved him before the Ninth Offensive got underway. But nothing, and I mean nothing that I could find after months of study, Warren did from March 29-April 1 warranted his relief. Sheridan even admitted at the court martial years later that he STILL didn’t know what Warren did on April 1, and didn’t care! That’s asinine, and makes Sheridan look terrible. He couldn’t admit one mistake, a mistake which ruined Warren’s career. And don’t get me started with the fact that Sheridan placed Griffin in command even though he wasn’t the senior division commander. Sheridan was Grant’s hatchet man, and they both come away from this smelling fairly foul. Grant had a blind spot for Sheridan. Sheridan was completely insubordinate to Grant in the days leading up to the Ninth Offensive. He was rewarded with “army” command during the Ninth Offensive. If by justified, you mean “acting within the bounds of his orders and with some motivation” then yes Sheridan was justified in relieving Warren. However, I think Sheridan was incorrect in his decision. I would further argue that if Warren was going to be relieved it should have been in Dec/Jan not during Five Forks. Warren does not seem to have shown anything different on 31 Mar & 1 Apr 1865 than he did in 1864. Either Grant did not have confidence in Warren and should have relieved him between campaigning seasons, or he did have confidence in Warren and should have left Warren in command unless perhaps he committed some serious screwup (which he did not do at Five Forks, nor did Grant’s order to Sheridan include such a criteria – as has been noted in the debate). 1. Grant might have relieved Warren for White Oak Road if he had known the details, and not been concentrating on the next move. 2. Griffin might not have been senior, but he was the best choice. Seniority wasn’t an issue that much anymore. I would like to add a multi-part question to this debate: why were things even in a situation for Grant’s order to Sheridan regarding Warren to be given in the first place? Why was Sheridan given authority to relieve Warren when Warren had seniority over Sheridan (Warren May 3, 1863 vs Sheridan Nov 8, 1864, if Wikipedia is accurate about their respective promotions to Major General)? Why is Grant the one giving this order instead of Meade – was Meade so thoroughly unofficially demoted to a glorified staff officer at this point as not to be the one giving orders regarding the removal of his own corp commanders? Was Sheridan still operating under some kind of authority as commander of the Army of the Shenandoah, even though said army now consisted of only the Army of the Potomac’s Cavalry Corps? Do you mean Warren fighting his corps piecemeal? If so, he did know. Meade wrote him and Grant asked why Warren didn’t fight his corps together that same afternoon even before Griffin’s counterattack. In the end, the day was a net positive. I’m not sure Warren should have been relieved for that. If he should have, then Hancock should have been relieved for Ream’s Station as it was far worse. If you mean something different, I’m all ears. Same here. I’ve been under the weather since Saturday. I’ve had most of these posts scheduled and written up for weeks, but the last second tinkering, tweaking, and adding has been exhausting. I’m gonna need a bit of a break! Josh, this is a good question, and one I’ve thought about from time to time. From everything I’ve read it’s never been adequately explained, not by Grant, Sheridan, Meade, or any of their staff. Meade was dead by the time of the court of inquiry. I wonder what his testimony might have looked like. I have to believe Sheridan wouldn’t have liked it much, but that’s obviously speculation on my part. If anyone has information which might explain this, I’d love to hear it. It may be as simple as “what Grant says goes” at this point in the war. Burnside served under Meade in the AotP after Grant discovered an independent IX Corps was unwieldy. Warren reporting to Sheridan in what was intended to be a temporary battlefield arrangement seems to be more of the same. Grant gave Sheridan the authority to relieve Warren because of some monumentally stupid work by a member of Meade’s staff. At about 8:30, Meade sent a Lt. Warner to Fifth Corps HQ to consult with Wainwright, Fifth Corps artillery commander (the cannon did not go with the infantry). Grant asked that Warner find out where Warren was—at this point, there had been no word from Warren for a while. Warner (this story is hard to tell with both Warner and Warren in it) went to Fifth Corps HQ, found Warren’s adjutant, Locke, and asked him where Warren was. Locke had just woken up—it is possible that Warner woke him up, the testimony is unclear—and told Warner that Warren was at the Gravelly Run crossing where a bridge was being rebuilt. This information was FIVE hours old, and neither Locke nor Warner thought this might be an issue. Warner goes back and tells Grant that Warren was at Gravelly Run, which is where Grant knew him to be hours before. Grant assumes Warren is being dilatory, and sends Babcock off with the fateful order to Sheridan. At this point in time, Warren was writing the note to Meade reporting his arrival near Dinwiddie. No one on Meade’s staff thought to inform Grant of this when the note arrived a couple of hours later. Warren’s attorney knew this at the Court of Inquiry, but (IMO) did a poor job of making the point. I doubt that anyone else understood it. Few modern writers have pieced it together. The tragedy is that GKW had told Locke to go get some sleep, because he would need to be fresh the next day, and he (GKW) could oversee the rebuilding of the bridge. Locke should have been smart enough to tell Warner that his information was hours old. 1) You have the incorrect information about Sheridan’s rank. His promotion to Major General in the Volunteer service was dated December 1862. In 1864 he was also promoted to Major General in the Regular Army. Warren was promoted to Major General in the Volunteer service in 1863 and never to Major General in the Regular Army. So Sheridan was senior to Warren all along. 2) Grant was giving the orders because Sheridan reported to Grant and not to Meade. In 1865 Sheridan was not part of the Army of the Potomac and neither was his cavalry command. Brett, the difference (IMO) between Warren/White Oak Road and Hancock/Ream’s Station is that Hancock had a generally good track record behind him to that point. Warren, not so much. Thanks for this. It’s another reminder that I need to bite the bullet and read through the entire court of inquiry at some point soon. Fair point. Hancock was never on the verge of dismissal like Warren had been with Meade. Who was the older man? Ask most folks, and they likely assume Warren, by a good deal. Truth is only a year separated the two. And given Sheridan’s personality, one can easily see a tendency to see a challenger in his front – and if you know Phil Sheridan, there were few who really knew what they were doing. I think, however, their ages, and Sheridan’s unlimited ambition, played a major role here. As for their ages, I don’t see that as being much of an issue. Warren was the older man, by about a year. Why do you think people assume Warren was a lot older? I’ve never quite understood exactly what it was that Warren did/failed to do which earned being relieved – as opposed to what Sheridan may have perceived in the midst of his paroxysms at Five Forks. But then I’ve been fairly persuaded by Eric Wittenberg’s Little Phil thesis in general. There are two answers to your question, John. 2. Warren did not exert himself to get ready for the fight, and said things suggesting he did not want to fight. 3. Warren was not present to rally some of his troops when they wavered during the attack. The Court of Inquiry essentially ruled that much of this (not all of it) was bogus. Warren’s actions and demeanor during preparations for the battle and the battle itself gave Sheridan reason to believe that Fifth Corps would do better under one of the division commanders. Why did Sheridan put the bogus specifics in his report? Warren had been given permission by Grant to publish his report of the battle, which he did, in one of the NY papers. Sheridan took that as an affront, and decided to “stick it to” Warren in his own report. That backfired on him, eventually. All of this is just my opinion. Warren was the go-to man throughout the Overland Campaign. Whenever there was a job to do he was assigned to accomplish the matter. His personality however woin Grant’s enmity. Woe to the man who ended up on Grant’s bad side. Grant used his lackey, Sheridan to illegally remove Warren from command. Only the President had the authority to remove the General. In the ensuing days Warren was entitled to a reconsideration from the CC, Lincoln. Well we all know what occurred that April. For a variety of reasons Warren was kept from his legal right to keep his reputation until a non-Grant man held the Presidency. If you read the minutes from the court of inquiry, ( which was rigged to give Grant and Sheridan immunity) , the reader can see Grant’s in-your- face attitude, as well as Sheridan’s complete inability to lie convincingly. Grant also manufactured the orders that seemed to incriminate Warren. U.S. Grant committed a felony and was an usurper of the office of President. Sheridan – scum of the lowest order. There were a group of patriots to the Union cause, (Averell, Thomas, etc. ), that were maligned and poorly served by Grant and Sheridan. Arthur, I don’t mean to be ugly (although many people will say that I am) but you are badly mis-informed. Warren was hardly the go-to guy—that would be Hancock, for the most part. 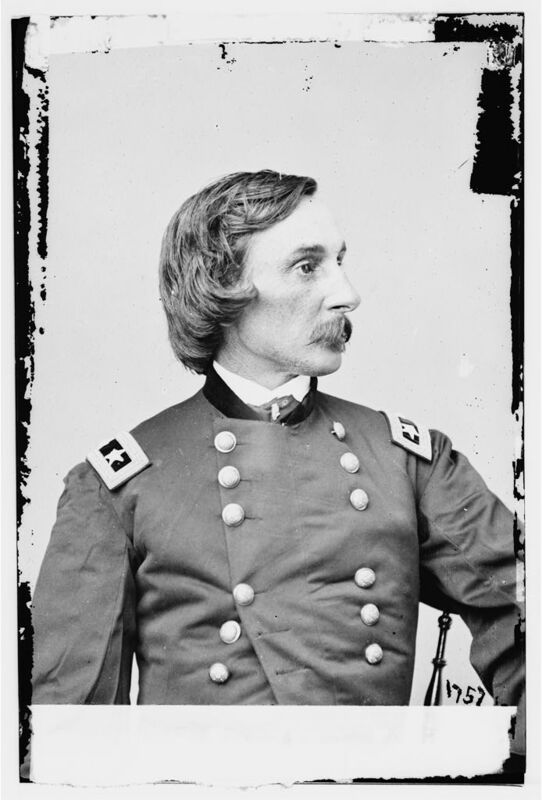 Grant is on record in several places expressing his high regard for Warren, and he had a tendency to become almost infatuated with officers who had done well at West Point (as Warren had). Grant had full authority to relieve any officer in the army, and he delegated that authority to Sheridan. There was nothing illegal about the relief—perhaps it was unwise, or not the right thing to do, but it was legal. Even though I am so late to the party that lights are out and the doors are locked, I wanted to take a moment to compliment this debate format, the participants, and the information presented. For me, this was a pure learning experience, sans all of the vitriol, baseless opinions, and mean-spirited attacks. I could read this sort of presentation all day, supplement with further sourcing, and leap ahead in my understanding of various Civil War topics. I ran across the mini-version of this debate on a book review thread, and the mere mention of “debate” sent me scurrying around for the meat ‘n’ potatoes (okay, the links were at the bottom of the page). Much obliged that you folks decided to pick up the topic a year or so later, and lucky for me, I found it a year after that. Hopefully, this approach will be tested again, because I loved it. Shoshana, thank you very much for the compliments. I can take very little credit myself. Jim Epperson approached me with the idea, explained what he wanted to do, and helped me work on narrowing down the format/rules. I have definitely wanted to try this again some time. I need to either go back to Jim or approach other Petersburg students and see what they’d like to discuss. I had fun doing this and I learned a lot as well in doing the research and compiling notes. Brett, my life has been very complicated for the past year, but having got my son off to college we may have a little daylight appearing. So if there is some other issue you want to treat this way, let’s talk!